This is a very beautiful project, but calls for a certain amount of experience in jewelry-making and soldering (Plate 3J, upper). The frame for the tray is soldered up from "gallery-wire", a type of ornamental strip available from dealers in jewelers' findings, supported on four half-ball feet, soldered on, and handles consisting of two pair jig-sawed metal wings, between which a handle cut from round rod is inserted. Details of design will depend on the materials at hand, and the proficiency of the maker in this type of metal-work. The three trays shown in the lower part of the photo are made from 1/8" sheet material, which has been softened by heat and shaped in a wooden die. This process is described in the chapter on Embossing. This material is particularly suitable for serving-trays, since it preserves its brilliant finish and color regardless of the treatment it might receive in use, and even when the finish might become a little dulled from constant use, it can immediately be brought back to its original glass-like surface by means of a little brisk rubbing with proper compounds. The various sheets, from 1;8" to 3/8 in thickness, and from 6"x16" to 12"x24" provide a various assortment of sizes, which in combination with various types of easily-contrived handles will produce some very beautiful designs. Various suggestions are sketched in Figure 30. Fig. 30. Group of designs for serving-trays. Project No. 19. A trip through any hand-bag department where the more expensive types are displayed will demonstrate the popularity of carved plastics for this purpose, and even the cheaper types very frequently have a clasp or color-spot made of this material for ornamental purposes. 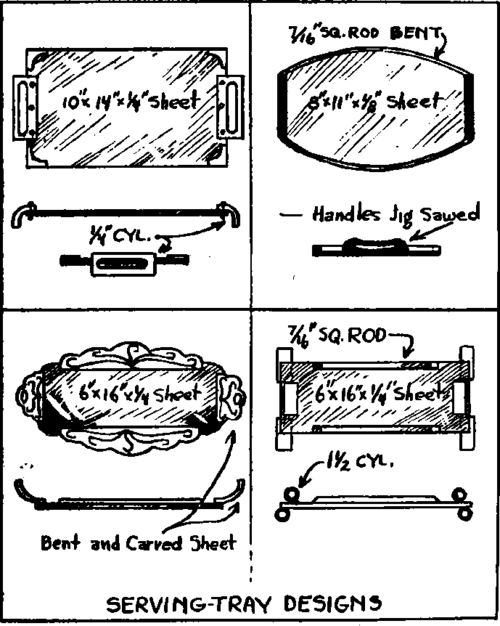 In Plate 3K are shown three very simple types, fret-sawed from sheet. Any degree is elaborateness in the carving is permissable on this type of article. The means of attaching to the hand-bag of course will vary with the type of metal hinge and fitting available, so no details are given on this subject. Cut-out ornaments, initials, etc., are also frequently used, being attached directly to the leather, either with cement or screws. In Plate 3G will be found decorative desk accessory frequently made in plastics, the letter-holder. This likewise can take infinitely varied shapes, depending on the size and shape of material available. The two uprights, the front one being smaller than the rear one as a rule, although in this case being of the same height, should be fastened with screws passing thru the base and into the upright, and the base should be of a little thicker material than the uprights, and in a darker contrasting color.